Plimoth Plantation is a fabulous living museum in Plymouth, Massachusetts that highlights the original settlement that the pilgrims would live at that had been established in 1620 by the English colonists, whom many would later be called pilgrims. They would be some of the first settlers who had emigrated to the new world to avoid religious persecution and to find religious separation from the Church of England. These outstanding re-creations would be sourced from the many first and second hand records, period paintings and relics, accounts and articles, with the museum still conducting ongoing research and scholarship, as well as historical archaeological excavations and curation both here and abroad. In the 1700 English village part of the museum, their interpreters have been specifically trained to act, dress and speak appropriately for that time, and are called historical interpreters, interacting with the "strange visitors" or modern public, in the first person, talking about their lives and hardships, answering questions, and taking part in various early activities like planting, blacksmithing, animal husbandry and cooking. The 1627 village loosely follows a timeline, chronologically representing the calendar year 1627 from the latter part of March through November, and showcases day-to-day life and seasonal activities of those early settlers along with featuring many key historical events like special celebrations and funerals. The museum would be established in 1947 by Henry Hornblower II, a Boston stockbroker that had childhood ties to the Plymouth region and because not one of the buildings would survive and there are few relics left. Hornblower was an amateur archaeologist, and began the museum as a proxy. Starting out with a "First House" exhibit, where the Mayflower II is docked, the museum has continued to expand into the nearby fortified village by the 1950s. The biggest open-air area of the museum is called the 1627 village and it resembles the original layout, as best can be assumed, that is generally accepted to have been constructed 2.5 miles to the northwest. 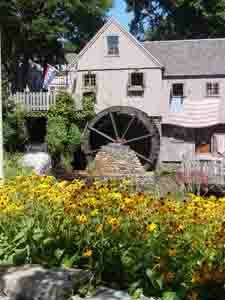 The Jenney Grist mill is a working grist mill in Plymouth, Massachusetts that is a reconstructed replica of the original Jenney grist mill, and stands on its original site today. John Jenney came to the new world from Leyden in 1623 on the Little James, and the original mill would be constructed in Plymouth Colony by John in 1636 and would be operated by him until his death in 1644. After his passing, his wife Sarah and their son, Samuel, would continue to run the mill until it was purchased by Stockbridge for legal reasons, but would burn down in 1837. The mill would be reconstructed in 1970 on its original site on Town Brook, so that now visitors can watch the corn grindings, take a tour of Plymouth, see the mill working, and learn about the lives of the Jenneys and even visit an ice cream shop. To prepare the stone for grinding is called "dressing" and would start with removing the frame and hopper from around the stones. The stones have be lifted and moving the top runner-stone, which can weigh up to 2500 pounds each, the miller has to use a large crane made of wood that has long tongs, called bails, to lift the stone up and off its partner. The tongs are attached to the stone using two big pins that go into holed on each side of the stone, which is then lifted and raised off the bed stone and turned upside down, then moved to the side and put on wooden blocks. The miller now has access to the top of the bed stone and the bottom of the runner stone so he can start dressing. He will use a metal pick, called a mill bill that is used to remove any foreign materials or obstacles from the grooves or teeth that have been cut into the face of the stones. It usually takes about three days to do this process and is usually done after grinding some fifteen to twenty tons of corn or other grain. It was the Native Americans that the pilgrims came into contact with that would teach them to use a mortar and pestle to grind their corn, until a mill could be built.